In Madrid, 1980, five years after Franco's death, Juan de Vere takes a job assisting Eduardo Muriel, a film director in the twilight of his career. Muriel is eccentric but charming, an irresistible idol for Juan. But certain people, and forces, loom, among them Beatriz, Muriel's difficult wife; and Dr. Jorge Van Vechten, a mysterious figure implicated in unsavory rumors involving Muriel. As Juan digs deeper into all three of their lives, the deceptions and loyalties he begins to uncover will change the course of his young life. 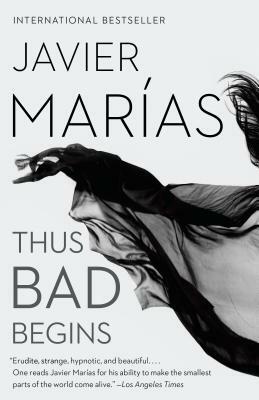 Thus Bad Begins is an ambitious, sweeping novel of a young man and his country, and of life in the wake of a dictator's reign. JAVIER MARÍAS was born in Madrid in 1951. The recipient of numerous prizes, including the International IMPAC Dublin Literary Award and the Prix Femina Étranger, and a finalist for the National Book Critics Circle Award, he has written fifteen novels, three story collections, and twenty works of collected articles and essays. His books have been translated into forty-four languages, in fifty-seven countries, and have sold more than eight million worldwide.